Last May's local elections were good for the Tories - particularly in London. Many of the gains were made on the back of policies that didn't exactly fit with David Cameron's priorities, however. Tories swept to power in Ealing, for example, partly on the back of opposition to proposals for a major tram scheme although the Tory leadership had been unhelpfully extolling the value of trams during the campaign. The national leadership has been ultra-cautious on tax but Hammersmith & Fulham Tories achieved one of the best results in the country by promising to relieve the burden on their borough's hard-pressed council taxpayers. H&F Tories have made good on their promise by today announcing a 3% reduction in council tax - the first for ten years and likely to be the largest council tax reduction in the country. It must be hoped that Hammersmith and Fulham will join the elite Tory London councils of Westminster and Wandsworth. Russell King recently wrote about 'the Wandsworth way' on YourPlatform - Delivering lower taxes and world class public services. Two of H&F's star councillors have written for YourPlatform in the last year. Councillor Harry Phibbs drafted one of ConservativeHome's best-ever Platform pieces last month. Read Harry's '100 questions councillors should ask council officers' here. Shortly after the Tories won the borough Greg Smith explained how they did it. Also of note is how Conservative Future members have been integral to the renaissance in H&F. You can watch Donal Blaney interview Mark Loveday on this from 18 Doughty Street's fresh on-demand feature by following this link. Superb news, well done to the Conservatives at H&F. Three very loud cheers for Hammersmith & Fulham. They campaigned on a specific manifesto and now they are implementing it. They are demonstrating that some politicians can be trusted and that it does make a difference who you vote for. ...oh, and all this at the same time as proving that tax cuts can be electorally attractive and delivered without threatening popular key services. An early favorite for a ConservativeHome award? Good to see Harry Phibbs back on the scene. I can remember when he was kicked out of the party on some ridiculous pretext. H & F are leading the way. Now let's hear it for them from David Cameron. Many thanks for posting this item. The Council Tax cut is just a start. There is huge scope for greater efficiency in local government which means there is scope for Council Tax cuts even when cutting debt and improving services are also needed. When told it was impossible we were sustained by the example of Wandsworth. I hope others will now also take encouragement from us. Well done to them. Given the problems with central funding of local government, thats an even better acheivement. This is fantastic news- I look forward to my council tax coming down! Mass cross London migration to H&F! In the pretext of current local authority funding this cut is truly remarkable, and I for one can be proud of being a member of the administration which delivered on this. We were elected on a platform of lower council tax yet better services and we are now frimly on course to achieve both of these objectives. Excellent news!!!! A Council that promises what it delivers.... Well done Hammersmith & Fulham - as a local resident I am pleased that I will have a little more money in my pocket this year. Sorry I should have said "delivers what it promises" - the good news has clearly affected my brain! Another key to this was a united team with a single minded purpose. This is what we were elected to deliver. Every Tory councillor in Hammersmith & Fulham are 100% behind Stephen Greenhalgh delivering these savings and this council tax cut. Well done to my local Conservative Council! I am proud to represent in Parliament an area where taxes are coming down, and look forward to the same under a future Conservative Government. Hammersmith & Fulham Conservatives are showing the way for the national party - pledge a firm tax cut, increase your vote from 40,000 to 60,000 and deliver on the pledge in your first budget! Well done to Stephen and his team of young councillors. Get these chaps to tutor Osborne PDQ - there may yet be hope for the soul of the Tory party. It's brilliant news. 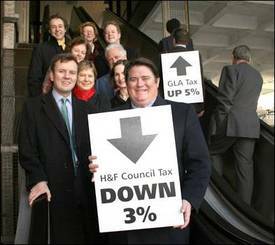 I too am proud to be part of the new administration in Hammersmith and Fulham, whose cabinet, lead by the formidable Cllr Stephen Greenhalgh, is finally bringing down council tax to respectable levels for our local residents. Onwards and upwards. "H&F is thus an early nominee for Taxcutter of the Year, 2007..."
It would be good to think that, after the May elections, this might develop into a crowded field. The problem will come if Gordon Brown decides that this is an award he wants to contend for. Let's hope the lessons are learnt by colleagues locally and nationally! Well done Hammersmith & Fulham, an inspiration to all those of us Tories in London local government. It would, of course, be nice to hear some public congratulations and encouragement for H & F's Conservative administration from the Conservative Party leadership as well. Congratulations, it's always good to see peoples' money being given back to its rightful owners. I would be interested to know how the tax cut was afforded and whether a similar cut could be applied to other councils? Well done H&F, may it long continue. This is more like the Tory Party. Well done. It is about time Cameron woke up to the fact that cutting taxes IS attractive to the voters, especially since the Council Tax has doubled since NL took over in '97. If H & F can do it, so can other Councils. You are so right Torygirl. This is real Toryism in action. When are we going to see the leadership follow this example? Okay, so approaching 24 hours after our announcement I am even more fired up! This is politics in action. I got into local politics to become part of a team that didn't just sit around moaning about the current state of affairs but to be part of one that was proactive in making a very real difference. That is what makes it so exciting and keeps me, certainly, working hard as a councillor because there IS an end goal in site and that's to be in power nationally in 2009. I believe that every bit of casework and waste cutting locally does matter and will win us votes nationally. The Town Hall will continue to become an even leaner and meaner machine. We are a very driven administration. Congratulations to Hammersmith and Fulham. This is a great achievement given the current funding round. One word of caution - it is easy to make initial savings and cut taxes when taking over from high spending and poor value for money Labour and Lib Dem Councils - maintaining that progress is much harder. However, I know that H&F are doing all the right things to not just deliver lower taxes this year, but to deliver lower taxes in the future as well. As you know, Councils have to have a 3 year medium term financial strategy with an indicative balanced budget in each year. Suffice it to say we are confident we can do this again next time and that you will see us on ConservativeHome again this time next year! I wouldn't expect much criticism or dissent on this website. What I am more surprised about is the lack of discussion about how these cuts have been achieved, what impacts they have had in terms of service delivery and what actions are being taken to mitigate the risks around cutting budgets and service standards. It's really quite an arrogant attitude - how simple those foolish Labourites are! They can't even work out how to stop spending money! Good luck with that approach.